This entry was posted in Releases on Saturday, May 26 (2012) by megasys. Minecraft saves player position in every 2 seconds. When using Optifine, it’s 20 seconds by default, and can be adjusted in Options/Video settings/Other/Autosave. Unmined checks player position in every second when Live map and Player following is turned on. This entry was posted in Releases on Thursday, May 24 (2012) by megasys. This entry was posted in Releases on Monday, May 21 (2012) by megasys. 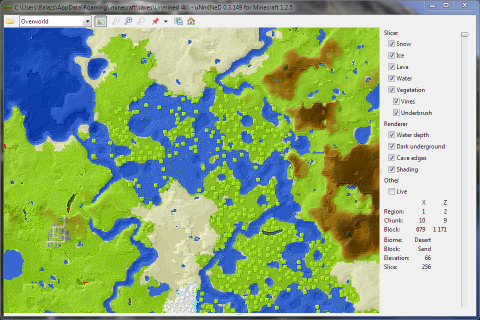 I’m generating a 40k x 40k world with large biomes using Minecraft Land Generator for testing. It’s at 25% (11 GB) after one day, and will be a huge taiga I guess. This entry was posted in Releases on Sunday, May 20 (2012) by megasys. Use double quotes (“) in command line when specifying filenames containing spaces or non-alphanumeric characters. This version seems stable and bug-free. Thank you all for bug reports, suggestions and feedbacks. Wanna see the GA stats of the reddit rush happened yesterday? This entry was posted in Releases on Saturday, May 19 (2012) by megasys. Unmined is now able to export very large maps into a single image (up to 360 000 x 360 000 blocks at 1:16 zoom). This entry was posted in Releases on Friday, May 18 (2012) by megasys. 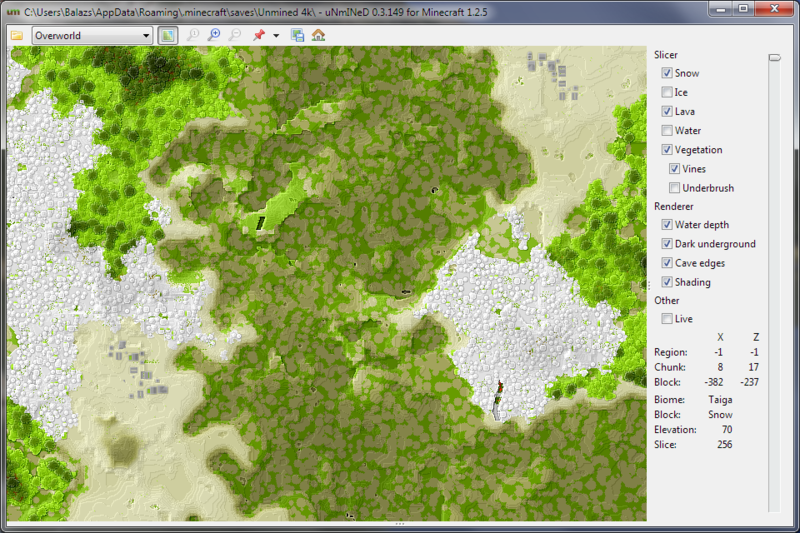 Zooming out will be available later. This entry was posted in Releases on Thursday, May 17 (2012) by megasys. This is a bugfix release (download). This entry was posted in Releases on Tuesday, May 1 (2012) by megasys. This entry was posted in Releases on Monday, April 30 (2012) by megasys. This entry was posted in Releases on Saturday, April 28 (2012) by megasys.